This wonderful fragrance smells fresh, crisp & delicious as if you have cut open an apple at the peak of perfection. This scent is available in the Ocotillo candle with hand blown glass, the Way Out West jar, and the room mist. New Mexico had a very special place for fruit in the desert called Dixon's Apple Orchard. It was the only place in the world to get the incredible Champagne Apple, fresh, crisp, and delicious. Going there was a fall tradition. In June 2011, the orchard was partially destroyed by the Los Conchas fire. The mountains surrounding the orchard suffered severe damage, leaving massive burn scars. In August 2011 heavy rains flooded the remaining orchard, nearly destroying it. The orchard now sits in limbo, its fate unknown. We wanted to carry on the memory of the beloved Champagne apple with this delicious apple scented candle. 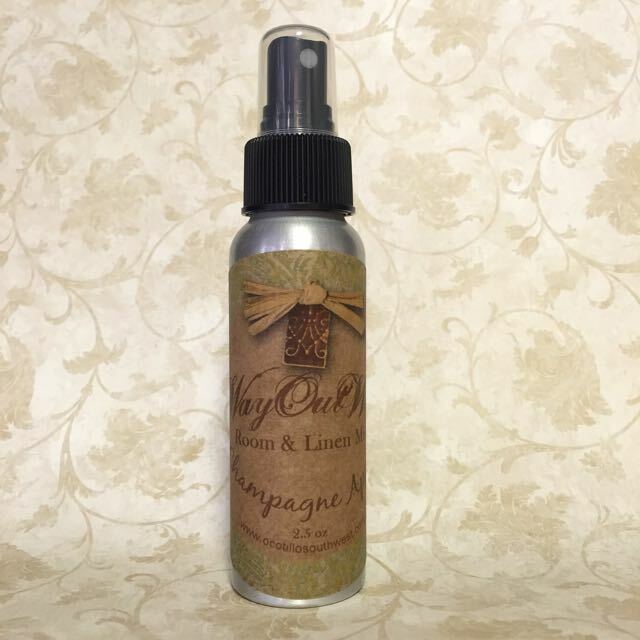 The room mist is a great addition to enhance the scent of your home, car, linens in your home including your sofas, throw rugs, and stale smelling blankets. Each bottle is approximately 2.5 ounces of concentrated fragrance. It is not meant for use on the skin!